You won't be left 'Staring At The Floor' when these guys are on stage - with gorgeous harmonies and a laidback, mellow sound, Wild Front put on a fantastic show. We seem to be becoming good friends with Wild Front here at The Edge after I interviewed them before and during Bestival (which were mostly about hummus), hung out with frontman Jack Williams at a Sofar Sounds gig in Romsey where we swapped cat pictures, and now at The Joiners for their second night of residency there this year – one that ended with an invite upstairs to interview them, for the third time in as many months. 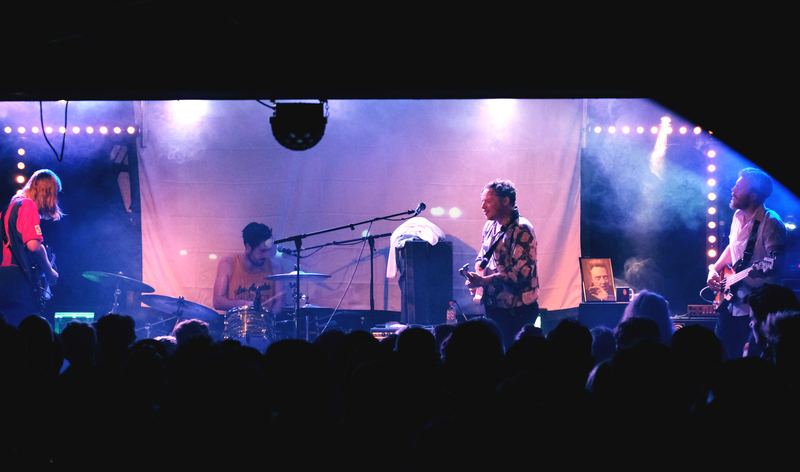 Support came from Leeds band Heir, who were like an indie-pop Glass Animals but swearier, encouraging us to find them “On all that crap that kids like” and to buy their “Crap [we’ve] brought down from the north so [we]can get home”. With songs on topics like when your ex leaves you for someone with the same name, excellent harmonies, and a ridiculous amount of energy, they were an excellent support act for Wild Front, as were the second – Valeras. Admittedly I heard less of this Reading quintet than I would have liked because I was talking with a photographer in the bathroom about veganism, but they were equally as funky, with a rockier vibe than the other two bands but not so much that they were alienating to the crowd. Surprisingly for The Joiners, the majority of people were actually in the room for both supports, which is rare to see – clearly, they knew there were good things happening on that stage. Having missed them at Bestival because of interviews, I was very much looking forward to seeing them in what is possibly my favourite venue in Southampton. Playing to a packed out Joiners, it was clear even from the crowd for the support bands that they had reached their goal of selling out, which was lovely to see. They incorporated visual elements into their live performance, a screen behind them showing graphics varying from fire (reminiscent of the burning letters at the start of their ‘Rico’ music video), a POV of driving along a road, Wallace and Gromit’s A Grand Day Out, and photos of the band from babies to adults. They even had retro games consoles set up on either side of the stage, fully playable, all done because they thought it looked cool. Although they gave us a choice of their final song, ‘Midnight in Hackney’ was their planned closer and the crowd choice and the perfect end to a remarkable set. ‘I Could Be Wrong’, but these guys are definitely set for big things.